Just a stone’s throw away from the cathedral of San Giovanni in Laterano, one can find one of the most curious pieces of architecture in the streets of Rome. 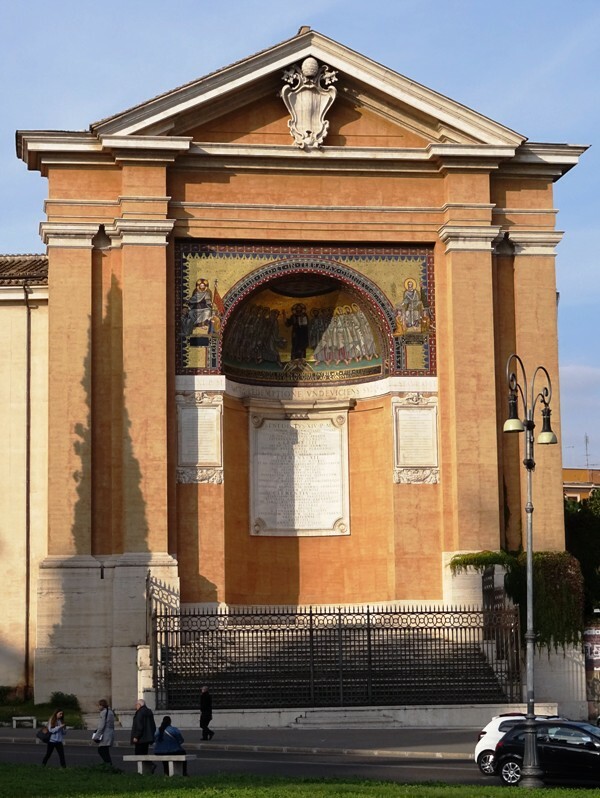 The Triclinium Leoninum consists of a brick aedicule with an apse and a colourful apse mosaic. At first glance, the mosaic may appear to be medieval, but upon closer inspection, it becomes clear that it in fact dates from the eighteenth century. The whole edifice is a replica of the apse of the large dining hall built by Pope Leo III (795-816), hence the name Triclinium Leoninum, Leo’s dining hall. The dining hall used to be part of the medieval Lateran Palace, which was built in the eighth century under Popes Zacharias (741-752) and Adrianus I (772-795). 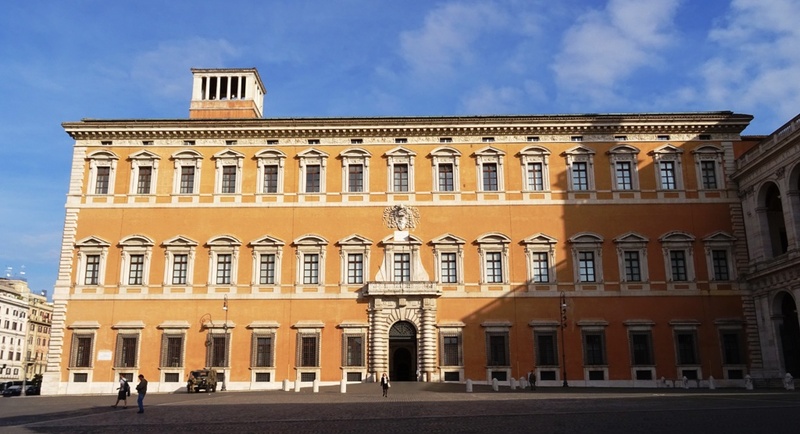 This palace complex was significantly larger than the current Lateran Palace, which was erected in 1586 by Domenico Fontana (1543-1607) by order of Pope Sixtus V (1585-1590). Part of the original complex were a large meeting hall (aula concilii) where five Lateran Councils were held, a Loggia of Benedictions built by Pope Bonifatius VIII (1294-1303), the Holy Stairs or Scala Santa (from the palace of Pontius Pilatus in Jerusalem), the papal chapel known as the Sancta Sanctorum and the aforementioned large dining hall constructed during the pontificate of Pope Leo III. This article has a few images that give an impression of what the complex must have looked like. In 1586, the aforementioned Domenico Fontana demolished most of the medieval complex, but obviously did not touch the Holy Stairs and the Sancta Sanctorum. These are now part of the devotional church of San Lorenzo in Palatio ad Sanctam Sanctorum. The late eighth century apse of Pope Leo’s dining hall was also left standing. Plans from the seventeenth century show that the outer part of the apse was facing south, while the apse mosaic was oriented towards the north. The current edifice is different, and this is because it is a copy, erected in a slightly different spot, with the orientation reversed. In 1731, when plans were in the making for a new facade for the cathedral of San Giovanni, Pope Clemens XII (1730-1740) decided that the remains of the Triclinium Leoninum were in the way. He considered the old apse to be too close to his projected new facade and ordered it to be demolished. Attempts were then made to move the structure to a new location, to preserve the precious mosaic, but these failed and the mosaic was damaged beyond repair. In 1743, the architect Ferdinando Fuga (1699-1782) was hired by Pope Benedictus XIV (1740-1758) to build a new edifice, a project that led to the current Triclinium Leoninum being set up. The painter Pier Leone Ghezzi (1674-1755) received a commission to replicate the mosaic. Whether this is a faithful reproduction of the previous mosaic is hard to tell. Ghezzi may have used his imagination while laying some parts. Christ, Saint Peter (or Pope Sylvester) and the emperor Constantine. Pope Benedictus XIV’s name is mentioned on the monument, and so is that of his predecessor Pope Clemens XII. Pope Pius XI (1922-1939) ordered a restoration and is therefore mentioned as well. It is rather special to find a mosaic here, out in the streets of Rome in the open air, but it has to be said that it is of rather mediocre quality. 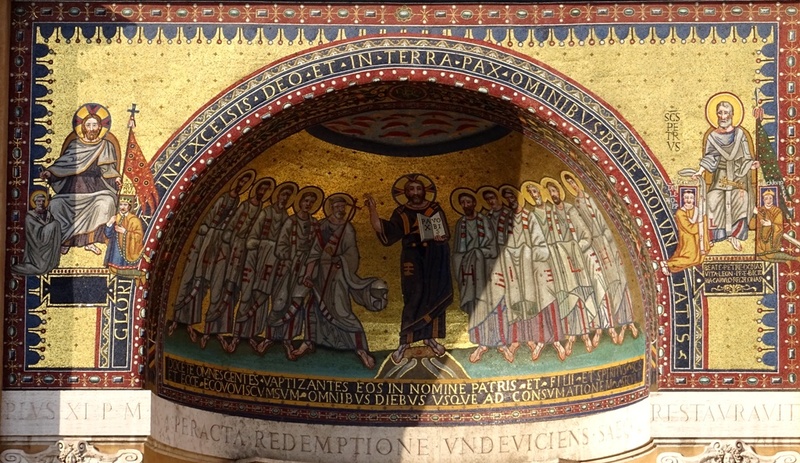 In the conch of the apse, we see Jesus Christ giving a blessing. He is holding a book with the words PAX VOBIS (“Peace to You”) written on the pages. Christ is flanked by eleven Disciples, led by Peter on the left (Judas has not yet been replaced; the scene is from Matthew 28:16-20). The mosaics of the arch are more interesting, yet again clearly not original and the attempt to make them look medieval in style has not been entirely successful. Compare them for instance to those commissioned by Pope Paschalis I (817-824) in churches such as the Santa Maria in Domnica and the Santa Prassede. The differences are hard to miss. 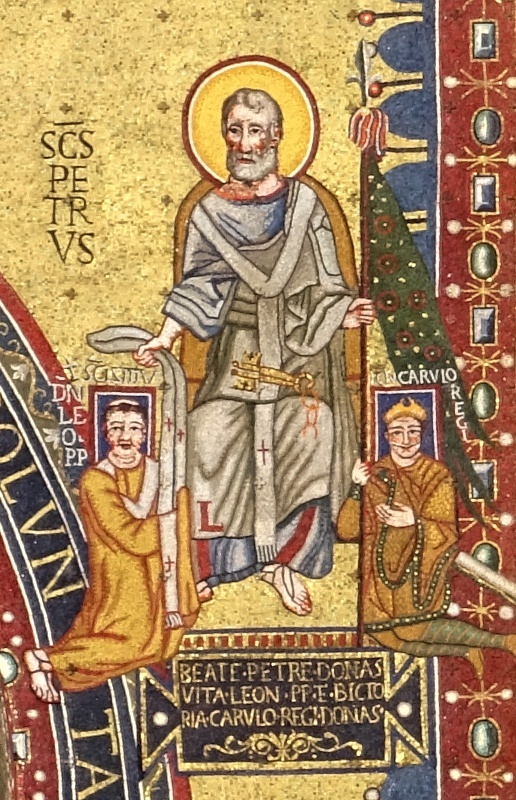 On the left, we see Jesus Christ giving a set of keys to a kneeling figure, who is not labelled, but has often been erroneously identified as Pope Sylvester (314-335). I am pretty sure that this is not Pope Sylvester, but Saint Peter himself, traditionally counted as the first bishop of Rome. Christ presents him with the Keys of Heaven, an event described in Matthew 16:19. The other kneeling figure is the emperor Constantine the Great (306-337), the first Christian Roman emperor in history. He is labelled R(EX) COSTANTINVS. Constantine is presented with a banner by Christ, and the banner is topped by a cross. Rather curiously, the text box below the two kneeling figures was left empty. The original mosaic must have had a text, perhaps asking for a long life for the Pope and victory for Constantine (see the text on the other side). Saint Peter, Pope Leo III and Charlemagne. If this pope happens to be Sylvester after all, the text may have been referring to the Donatio Constantini, the alleged transfer by Constantine of temporal power over the Western Empire to the Pope (in reality this event never took place and was later discredited as an elaborate fraud, concocted in the mid-eighth century; see Rome: Santi Quattro Coronati). 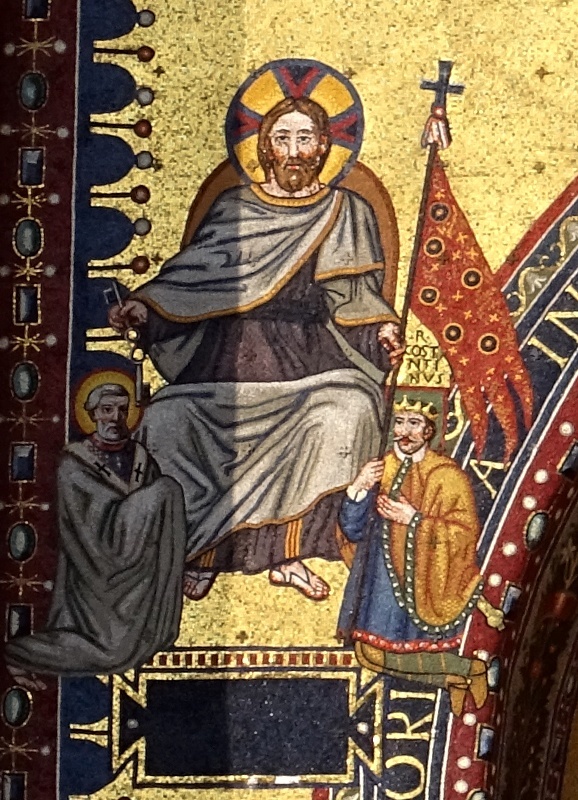 The empty text box and the missing caption for the kneeling pope may be an indication that this side of the mosaic was poorly documented. In fact, we can be pretty sure that Ghezzi largely improvised here. On the right, we see Saint Peter giving a pallium to a kneeling Pope Leo III. Leo must have been alive when the mosaic was made – the original mosaic that is – because he is depicted with a square blue nimbus surrounding his head. The other kneeling figure is Charlemagne, who is labelled CARVLO REGI or “King Charles”. From this we can deduce that the original mosaic was made in early or mid-800 at the latest, because Pope Leo III would crown Charles emperor of a new Holy Roman Empire on Christmas Day of this year. The text in the box below the two kneeling figures implores Saint Peter to give life to Leo and victory to Charles. Note that it uses the word BICTORIA instead of VICTORIA. Again the worldly leader is presented with a banner, which in this case appears to be surmounted by a fleur-de-lis. Finally, note the soffit of the conch. Pier Leone Ghezzi made sure he copied Pope Leo’s monogram here. Ghezzi may not have been the best mosaicist around, but he certainly had an eye for detail.